As part of their History topic on World War II, the year 6 children at Vernon Primary School received a very special visit from two remarkable people, with first hand experience of what life was like during the War. 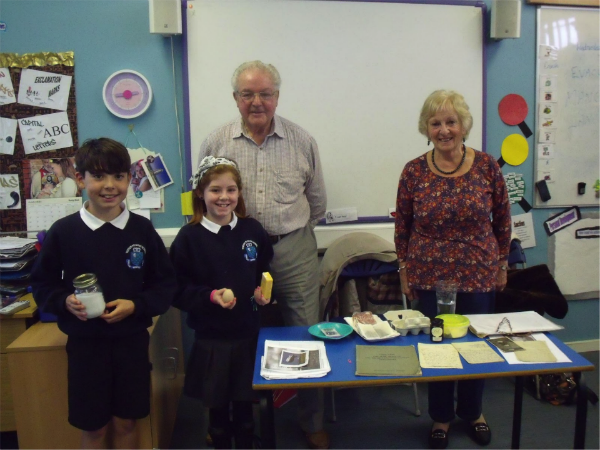 Mr and Mrs North, the grandparents of Ben Hussain, a pupil in year 6, volunteered to visit to talk to the children about life during World War II. The children found it fascinating to hear about school and family life in the 1940’s and they also learnt about the many roles played by individuals in the War effort. The children, who had prepared some well researched questions, found the experience extremely thought provoking and were even treated to some ‘swing dancing’ to complement their own compositions. The children and staff at Vernon Primary School would like to say a huge thank you to Mr and Mrs North for helping to bring the year 6’s topic to life.